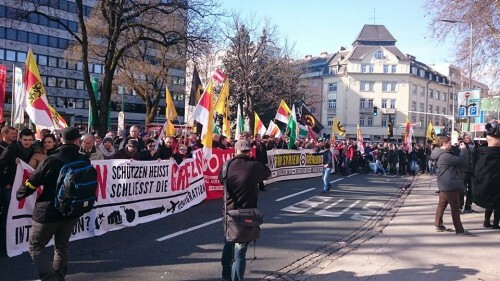 February 27, 2016 /69 Comments/in European Invasion, European Nationalism, Featured Articles /by Tom Sunic, Ph.D.
Below is my text-speech translated from the German original into English, delivered on February 20, 2016 in the Austrian city of Klagenfurt, at a rally against non-European migration. 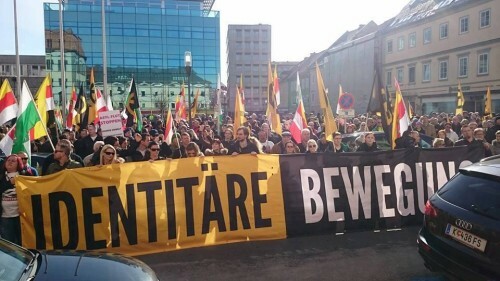 The anti-immigrant demonstration was organized by “the Identitarians” (IB) (Identitäre Bewegung), a rapidly growing cultural-political movement in Austria The IB rally was attended by approximately 700 people from all walks of life and all ages, including groups of younger people from Croatia and Slovenia. Approximately 100 police cordoned off the IB rally to keep them apart from the approximately 150 antifascist (“Antifa”) demonstrators marching several hundred yards away. My speech in the German language was held on the steps of the entrance to the city hall and lasted 30 minutes. The Antifa protesters, who could neither be seen nor heard from where I stood, were holding some posters including the one with the Yugoslav communist flag which read “Tito proved how to take out the Nazis” — a vicious threat indeed. 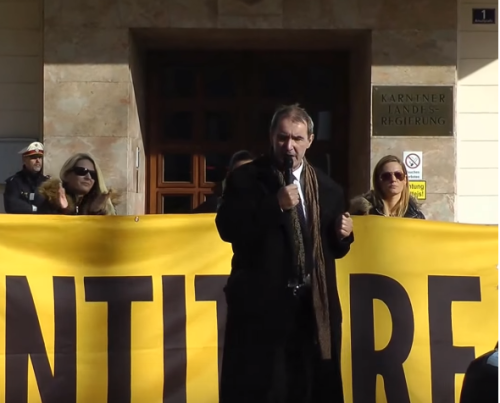 Next day I emailed a letter to the mayor of Klagenfurt and to the Austrian federal police with the copies sent to hundreds of different media outlets and politicians in Austria, complaining about the Antifa deaths threats against the IB rally participants. However, during the IB rally no incidents were reported. The Austrian mainstream media, other than the Antifa websites, reported relatively objectively about the entire affair. Everything always turns around the correct or incorrect definition of political concepts. We call ourselves freedom-loving people concerned about the future of our European identity. Our opponents, however, call us Nazis, racists and xenophobes. From our experience, from my own experience in the former Yugoslavia and in multicultural America, as well as my reading of the research of many sociologists, multicultural states tend to survive for only a short while. Sooner or later they end up in civil wars. My reference point is the artificially cobbled together state of Yugoslavia which ended up in shatters — despite its many academic well-wishers and all the eulogies written on behalf of its constituent peoples. Today’s migration chaos has officially been given the false name of “the refugee crisis.” Out of thousands and hundreds of thousands of migrants flocking to Austria, most are not refugees at all. They are “refugees” only in so far as were labelled as such in advance by the Austrian ruling class and media. Oddly enough, these migrants do not apply for asylum in Turkey or elsewhere on the proverbial route through the Balkans. All are eager to come to Germany. They imagine Austria, Germany and Sweden as La-La lands (“Schlaraffenland”) where they can live well and have their way with beautiful girls at will. But, hold it ladies and gentlemen! These migrants must not be blamed for their false perceptions; it is our politicians with their self-deceptive illusions who trigger such wishful thinking among the migrants. The self-obsession with multiculturalism among our politicians bears an additional deceitful name, namely the misnomer of creating a “welcoming culture”, although the real name that needs to be used in plain German is “the culture of self-elimination,” “the culture of guilt,” or “the culture of death,” or the “culture of self-hate.” The locution “welcoming culture” has nothing in common with the ancient European culture of welcome. Today’s welcoming culture is merely a word used by liberals for the failed communist project. What former Communists in Eastern Europe could not achieve by force, the System in place now is attempting to achieve through the ideology of multiculturalism. Communism fell apart in Eastern Europe because a better version came to fruition, albeit under a different name, in Western Europe. The System is convinced that the European peoples must be replaced in a multicultural super state by non-European migrants who in turn could constantly be reproduced as a new and perishable commodity. Let’s ask our politicians and the advocates of multiculturalism whether they want to live in multicultural neighbourhoods, such as the Favoriten district in Vienna, or the Neukölln district in Berlin. They will surely answer: “No way!” They love to lecture about multicultural society as long as they themselves can keep their distance from these areas, as long as they continue to live in safety in their own golden enclaves. If some day these do-gooders decide to take up residence there, I will offer them my sincere apologies. I have lived long enough in multicultural districts in South Los Angeles in the United States and have learned early on the life wisdom of the double lock on my apartment door and the safety that comes from owning firearms. From a historical and philosophical perspective, the multicultural craze today, including the so-called welcoming culture in Austria, Germany and the EU, is an offshoot of the ideology of hyper-moralism, as was well described by the German anthropologist Arnold Gehlen. It can be scientifically proven that the more the population of a country is ethnically and culturally homogeneous, such as Japan for instance, and the more a country is inhabited by ethnically and culturally interrelated citizens, the greater are its chances for survival, including feelings of mutual solidarity. Among non-European peoples in Africa and Asia, for example, it is hardly conceivable to import foreign peoples on a massive scale. Only among the life-weary European peoples one can observe such suicidal welcoming traits — not among wealthy non-European states such as Saudi Arabia, for example. Ultimately, such pathological hyper-moralism and altruism will take Europe to collective suicide. Let me paraphrase the German scholar Carl Schmitt: When a people becomes weary of politics, this does not mean the end of politics; it only means the end of a weaker people. Why is this hyper-altruism and this self-denial culture, or the so-called welcoming culture so pronounced in Germany and Austria and less so in other European countries? The reason for this is not hard to guess. Any criticism of multiculturalism by a politician or an academic in Austria or in Germany can earn him a stigma of “fascism.” And that means an immediate obituary in professional life. Werner Faymann and Angela Merkel, for fear of being dubbed Nazis, must therefore double down on the mass importation of migrants. The ideology of multiculturalism has become a kind of negative legitimacy for the whole of Europe and particularly for the German and Austrian political class. Conversely, any critical debate about multiculturalism is labelled “xenophobia.” The taboo word “xenophobia” has thus become a justification for the political class in Europe to forever uphold the status quo in the political arena. By contrast, critics of multiculturalism are being portrayed by the media as absolute villains, if not outright criminals. Hence the multiculturalists, in order to justify even the grossest aberration in their own System can comfortably depict their System as a lesser evil. The politicians in Austria and Germany are well aware of this, and therefore they need to be more Catholic than the Pope; they keep on increasing the massive floods of migrants into Germany and Austria. Accordingly, they treat the migrants better than the migrants expected in the first place. It is naive to think that the advocates of the welcoming culture can be refuted with arguments. The German word “do-gooder” (“Gutmensch”) mirrors perfectly this self-censoring, hyper-moralistic multi-cultural species. Should someone in Austria accidentally venture himself into voicing scientific observations about the myths of multiculturalism, he will land promptly on the radar screen of the thought police. In fact, the establishment and the media are only capable of maintaining themselves in power as long as they demonize those who think differently — as was the case in the former communist Yugoslavia, where each dissident was automatically labelled “a fascist or a criminal outlaw.” Austrian politicians, but also politicians elsewhere in Europe, are mired in political self-delusions. On the one hand, non-European peoples are being romanticized, and on the other, the native peoples of Europe are subject to demonization. The so-called culture of welcome is not sustainable. It cannot bring about mutual understanding among peoples; instead, it deepens mutual hatred of peoples. Countless times we have seen this in all multicultural societies. For example, Asian Americans in the United States do not like Afro-Americans and Afro- Americans are not beloved by Hispanic Americans. Riots between members of different peoples among today’s migrants are never discussed in public. Even if one supposes that all evil Germans, all evil Nazis, and all evil Fascists disappeared someday, this would not bring about perpetual peace. Racism and xenophobia are not proprietary trademarks of Austrians or Germans, or for that matter of other European peoples. The mendacious nature of the welcoming culture therefore requires us to clearly decipher our true enemy. However, the important thing to stress is that the Asian or African migrants are not to be blamed for the decline of Europe. Blame should squarely rest with the establishment politicians along with the capitalist “superclass.” In order to restore our German, Austrian, or indeed the identity of all Europeans, we must first dismantle capitalism. Multiculturalism is a false ideology linked to the myth of the boundless economic growth which depends on ceaselessly importing migrants. Non-European migrants know well that they can only live carefree in self-hating Europe. Feelings of self-hatred are unknown among politicians in their homelands. The financial capital of European oligarchs, coupled with feelings of guilt among Europeans on the one hand and leftist multicultural sermons on the other, in turn provide the terrain for the additional arrival of millions of non-European migrants. If Europeans were to rebuild their own identity, they must first rid themselves of unregulated capitalism. Foreign migration will then come to an immediate stop. Migrants will have no motivation to reside in our countries and wallow in false illusions. Soon we shall see how our history will unfold. In retrospect the question arises as to why did our Prince Eugene conduct such long wars against the Turkish invaders? Fortunately, however, history is always open and it is up to us to reshape it anew. This time it is not the years, but the days of decision that lie ahead of us. We all know very well the greatest political wisdom of all times: “whoever decides to be a sheep will soon find his wolf.” Therefore ladies and gentlemen let’s stop being sheep. The fight goes on. Thank you. Dr. Tom Sunic is author of several books.